Mary and the Witch’s Flower was a big fan hit when it opened in cinemas earlier this year, and now the home entertainment details have just been revealed. Altitude Film Distribution is handling the UK Home Entertainment debut and it will be released on September 10, 2018. The dazzling family animation is adapted from Mary Stewart’s beloved children’s classic ‘The Little Broomstick’. It features an amazing array of UK voice talent too including Kate Winslet (Finding Neverland, The Reader), Jim Broadbent (Paddington 2), Ewen Bremner (Wonder Woman) and Ruby Barnhill (The BFG) as the voice of Mary. Mary and the Witch’s Flower is released on Blu-ray, DVD and a collectable special edition Blu-ray steelbook including limited edition Art Cards and special bonus content. You can find details on all of these releases at the end of this article. 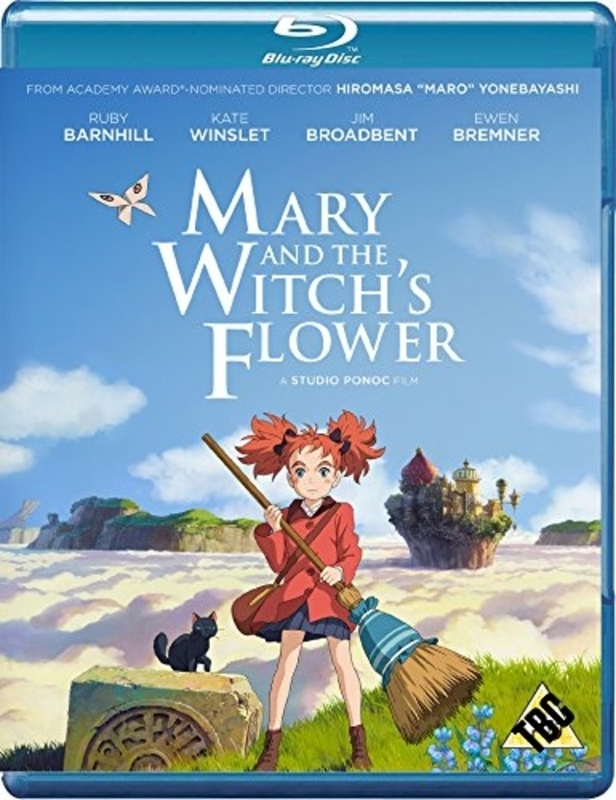 In the much-adored tradition of Studio Ghibli and from the creators of Academy Award nominated When Marnie Was There and Arrietty, Mary and the Witch’s Flower arrives from Studio Ponoc, newly founded by Studio Ghibli alumni, and featuring the same spellbinding hand drawn animation that has enchanted audiences all around the globe. Combining an action-packed girl-power adventure with a magical fantasy tale, the film introduces us to the spirited, red-haired Mary, spending the last weeks of summer in the English countryside with her Great-Aunt Charlotte. Following a mysterious black cat, Tib, into the woods she stumbles upon a magical flower that transforms a little broomstick into one that flies! Mary is fast whisked away high above the clouds and transported to Endor College – a school of witchcraft and wizardry! Mary is warmly welcomed by headmistress Madame Mumblechook (Kate Winslet) and the eccentric Doctor Dee (Jim Broadbent). Believing her to be a once-in-a-lifetime magical prodigy they give Mary a guided tour of the dazzling school and invite her to join. But Mary discovers all is not as it seems in this fantastical world and finds herself confronting great danger – soon she has to call on all her courage if she is to save the day. All editions on release will feature both the original Japanese language version and the superb English-language dub and in a special bonus for fans and collectors the special edition Blu-ray steelbook will feature exclusive limited-edition art cards and a special booklet featuring the original dialogue script.